The latest twist of the worm: Donald Jr. got caught trying to help his dear old dad get elected by engaging his Russian contacts to dig up dirt  on Hillary. 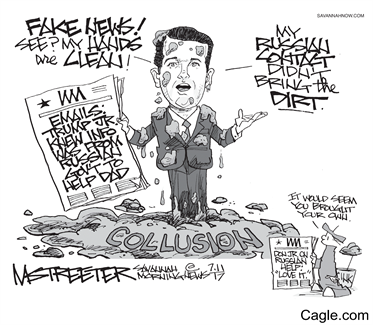 What he got was dirty. The Russians never delivered, and his father suffers another debasement in an already debased regime. It may be "a big nothing burger", as described by Trump's chief of staff, but the story adds to the blows against his prestige of office. Trump's public relations problems are making it very difficult for his colleagues on the Hill, who are trying to save their so-called health care reform legislation from oblivion. Defections among Repugnant senators are growing as public trust continues to erode even in red states.  US Person has personal familiarity with the corporate right wing's favorite political weapon. His costly experience has rendered him not anti-capitalist, but anti-fascist and pro-social populist. Label him if you must, only be accurate, please!